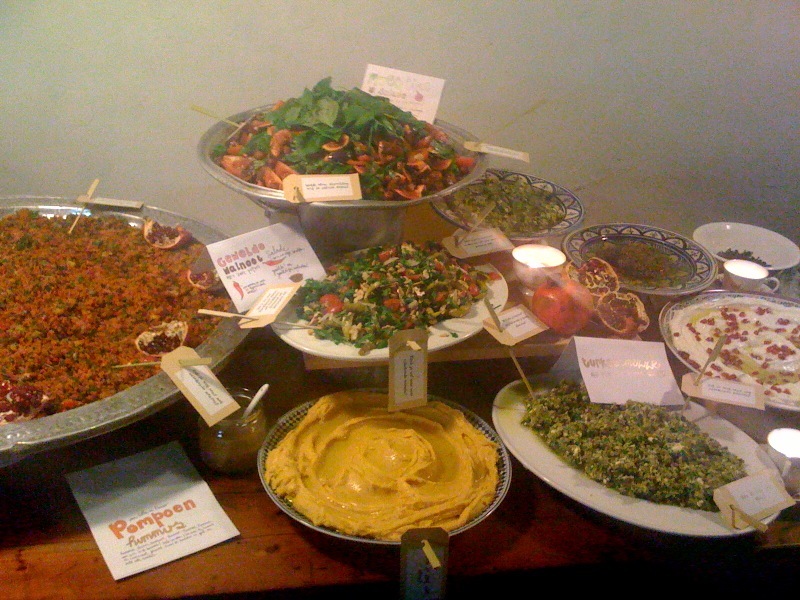 Now here’s some pictures of our wonderful dinner at Proef! First let’s start with the menu, by Kamal Mouzawak and us. Frikeh with wild herbs – traditional soaked briefly cooked frikeh mixed with rosemary, tym and oregano: our version. Arabia’s yufka rolls with garlic yoghurt and hot paprika oil. Kamal arrived on sunday with Christine, his business partner in Souk el Tayeb and Magyu, who owns our favorite little fish restaurant on the rocks in Batroun on the seaside. 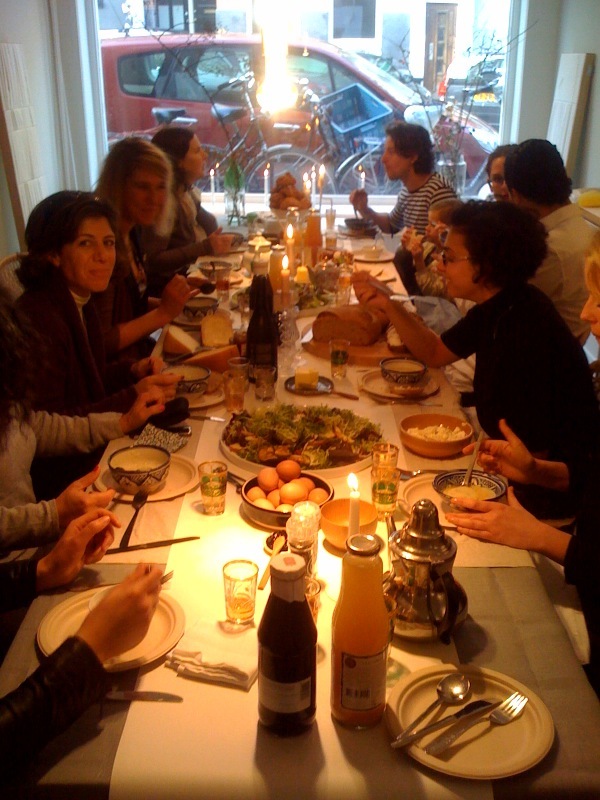 A lovely brunch was waiting for them…of course this time with Dutch delicacies and some good friends who went with us to Lebanon, of course including Marije Vogelzang from Proef. We were very happy cause another good friend specially arrived for the occasion of the dinner; Shir from the Tel Aviv farmers market. After an afternoon filled with food, stories and laughter we were ready for the real work the next day. 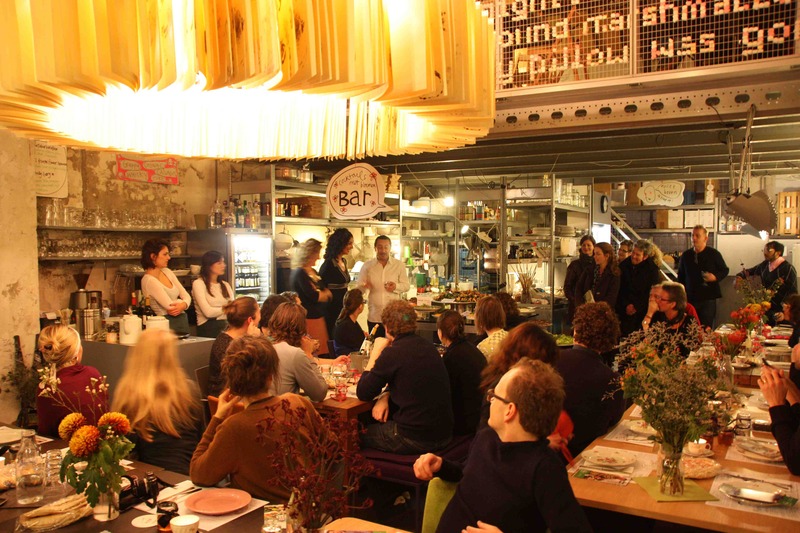 But…not without starting the day with warm apple pie at one of the oldest café’s in Amsterdam Café Papeneiland. From eleven on it was cooking time at Proef! As we are now used to cooking together, we did so many times in Lebanon, it was a pleasant morning and afternoon, with a nice lunchbreak at The Bakkerswinkel, and everything done in time. Of course Magyu was in charge of the aubergine salad, but she took the advantage of doing the pomegranate dressing for the fattouche, which was basically the pomegranate molasses, some garlic, salt and olive oil mixed together. Lotte was back in the kitchen too, sometimes almost in funny despair cause Kamal was telling her to squeeze the lemons like this, and then Magyu said oh no, you have to do it like this…which was of course the complete other way round. 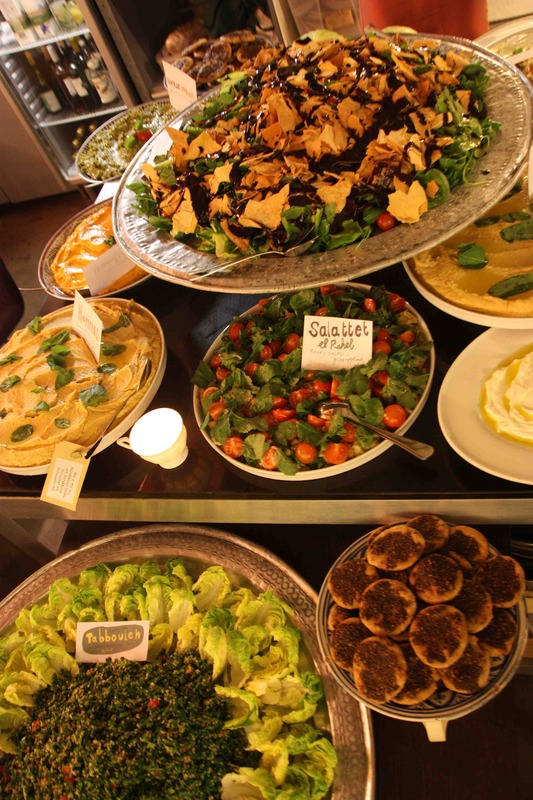 That’s what we call the Lebanese way…your own way. 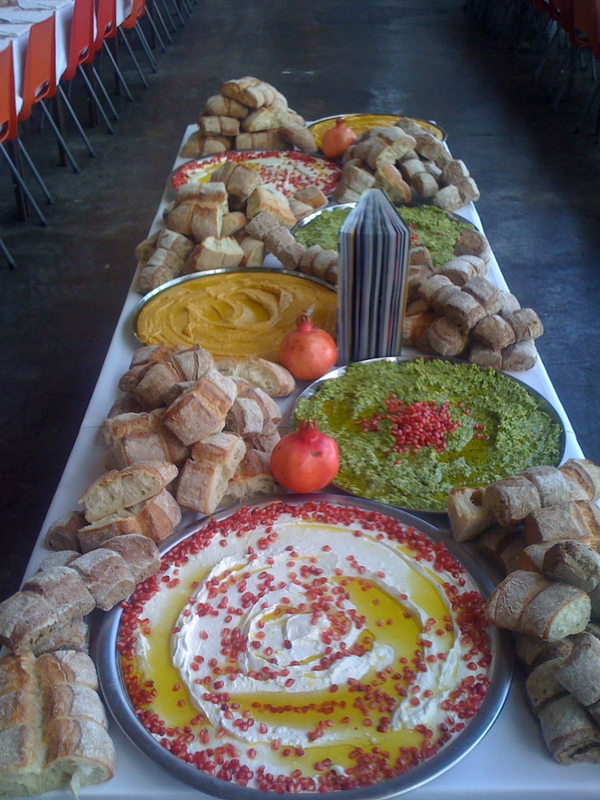 But we were all proud when everything was looking so fresh and appetizing all set and done on the tables. Waiting for hungry forks. And then the evening came, people sat at the tables, laughing, eating, drinking and enjoying every bite (so they told us all the time). And we were the happiest people on earth, sharing friendship and good food! Last friday we were already hearing Christmas bells. 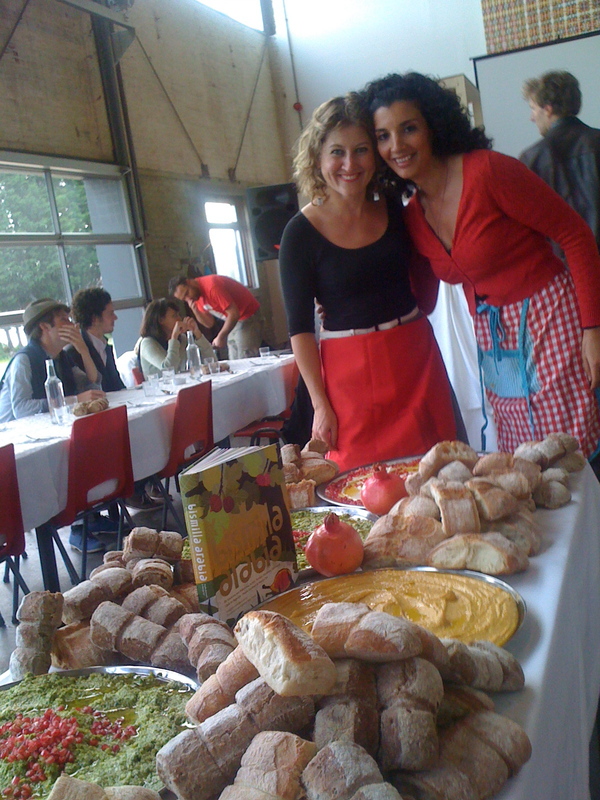 Our own of course: cooking new Arabia food for this years coming Christmas issue of the Dutch delicious. www.deliciousmagazine.nl It was in a great studio in Amsterdam, Studio 13, with lots of light, a big kitchen and many people, ‘cause usually there are two parellel shoots. So when photographer Harold Pereira and stylist Maaike Koorman were busy on the right side of the studio, we were cooking on the left side. And as the building is some sort of a loft (it used to be a tobacco factory) everything is open, and so is the kitchen. We found ourselves surrounded by the people of the ‘other’ shoot going on, all the time. So guess what: we were explaining how to make couscous and doing some sort of workshop while preparing our dishes. 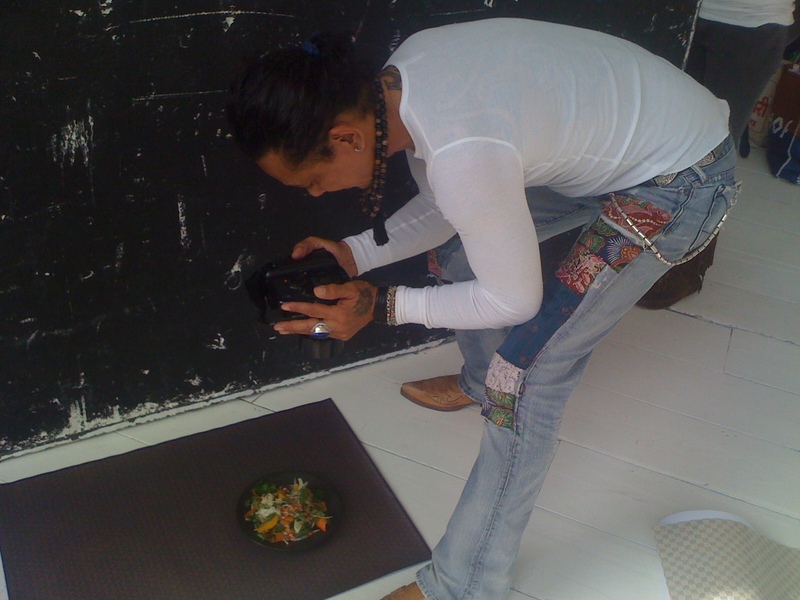 We felt soooo sorry we could not let them taste yet, everything still had to be captured by Harold’s camera. We made a delicious yoghurtsoup with saffron & almonds, the by now famous cauliflower couscous, deliciously warm comfort chickens with cumin, cinnamon and apricots, a crunchy salad of raw thinly sliced veggies like carrots, fennel, orange and tangy fresh herbs like mint, dill with crunchy aromatic toasted fennelseeds and a zingy orange dressing. 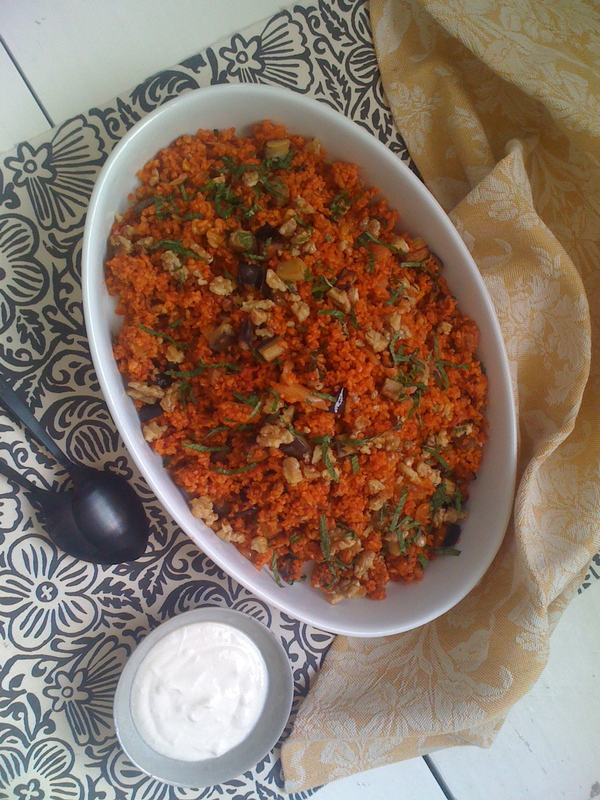 Sidedish was a delicious pilaf of bulghur with walnuts, paprikapaste and mint. To top it off our delicious pistachecustard in a new version with lemon and candied orange and grapefruit on the side. Of course you all have to wait for the Dutch Christmas delicious. issue to read and cook and get your saliva going for these ones. 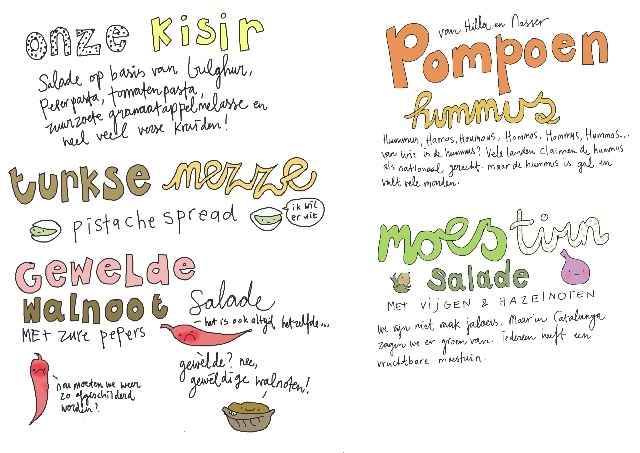 We’ll publish by then the translated recipes in English here. To get you to going some pics of the shoot to reveal a tiny little bit!